There are some great recent books on habit formation, both in the secular market (i.e. Charles Duhigg’s The Power of Habit, David Brooks’s The Road to Character) and in the Christian market (see James K.A. Smith’s You Are What You Love and other books of his). Leonard Sweet’s approach to habits is another thing entirely. The Bad Habits of Jesus is an examination of how Jesus own habits defied cultural expectations. Ms. Manners would take the rebellious rabbi to task; However Sweet sees Jesus as a revolutionary willing to buck convention to reveal the truth about God, ourselves and the world. Sweet’s exploration of these habits show how rude Jesus defied convention and suggests ways can learn from Him. The overall effect is kinda fun, but not too deep. As I read through the chapters I imagined ways this book could form the basis of a mega-church sermon series (similar to Craig Groschel’s Weird: Because Normal isn’t Working). The bad-habits motif is a tongue-in-cheek look at the picture the gospels paint of Jesus. Sweet’s hopes are that we will see something worth imitating in Jesus’ habits, even, or especially, his bad ones (xvi). Of course some of the habits Sweet looks at aren’t all that bad at all, just unexpected. Sweet wants us to see Jesus’ revolutionary edge instead of our soft, tame Jesus, whitewashed, flattened out and trapped by stained glass. Jesus didn’t live and die to make us good American citizens but to reflect His coming Kingdom. Sweet does succeed somewhat in showing us ways in which Jesus defies systems, culture and our expectations. However, the political aspect of Jesus (i.e. his challenge to Empire, how his claim of Lordship mutes Caesar) is fairly muted in Sweet’s prose. Sweet discusses how Jesus offends people in high places, (i.e. critique of the Pharisees and teachers of the law, calling Herod a fox), but he frames this for us as an example of how we ought to buck political correctness and likewise be willing to offend people instead of placating interest groups (63). True as far as it goes, but Jesus’ critique of political systems was more profound than combating political correctness. Revolutionary Jesus has much more to teach us about what it means to be faithful in the midst of Empire. I give this book three stars. The book doesn’t quite deliver on showing us the revolution implicit in Jesus’ habits and actions. But I still enjoyed it. Sweet’s Jesus has some bad habits worth copying and that may be the gateway drug to the revolution. Sometimes we approach issues ready to do battle. Talk-radio warns us of a subversive liberal agenda while the rest of the media caricatures conservatives as money-grubbing, hate-mongering xenophobics. Often faith gets co-opted in debate. Evangelicals are defined, in many eyes, by their stance on abortion and traditional marriage. Progressive Christians are written off for their lack of theological substance. Is there a way to ‘stop taking sides’? Can we approach issues without drawing battlelines? Is it possible to listen and hear the good on all sides of an issue and still offer a critique? 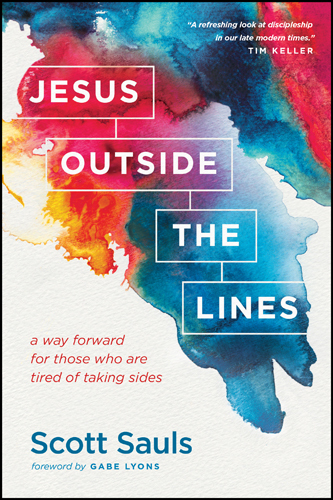 This is the approach that Scott Sauls commends in Jesus Outside the Lines. He aims at approaching issues and people in ways that are generous and tolerant and with clarity and conviction. This doesn’t mean watered-down niceness anymore than having strong beliefs means we have licenses to be jerky. Saul’ has two parts to his book. In part one he focuses on issues that divide Christians from one another. These include Red and Blue politics, abortion and justice for the poor, personal faith versus the institutional church and our different approaches to money. Sauls can find things on both sides of these issues to affirm. I liked his chapter on money because he points to a middle way between pursuing financial blessing and feeling guilty about our enjoyment of money. I appreciate that the extremes of prosperity and poverty are to be avoided (though I still weigh sacrificial giving/living a little more). In part two, Sauls promotes a generous response to those ‘outside the lines of Christianity.’ He argues that Christians should be quick to affirm the good in culture while still offering our critique. He gives a plea for us to emphasize both accountability for oppressors and compassion for victims. He challenges us to not write off each other as mere hypocrites but to see that we are all works in progress. Sauls gives a traditional defense of human sexuality but one that is sensitive to the LGBTQ community and the ways that they have sometimes been treated by the Christian community. He showcases how Jesus imparts hope for a brighter tomorrow and allows us to take a realistic look at the suffering of the world. Saul also takes us beyond Self-Help culture, helping to see ourselves how God sees us (which affirms the individual without enthroning her). This is a readable and sensitive book. I appreciated the way that Sauls navigated the cultural polarities and highlighted a third way. His opening chapter, begins with an anecdote where one of his sermons caused one person to dismiss him as a right-wing extremist while another congregant thought he was a left-wing Marxist (3). Often the way of Jesus is unsatisfying to all parties on the battlelines. But it is a better way! Sauls does not offer an exhaustive treatment of every important issue. Nor does he name every battleline. Two big issues that I think white, conservative evangelicals need to approach with generousity are systemic racial injustice and climate change. The past few years has highlighted ways in which our legal system treats minorities. Think Ferguson and similar tragic encounters between African Americans and police and the ongoing problem of minority mass incarceration. The dismissal of climate change by those on the Right and the alarmism of the Left reveals the way special interest has sometimes framed the contours of debate. Sauls can’t cover everything, but given the current significance of these issues, I wish they were handled head-on. Sauls isn’t the first author to explore the way Jesus defies our polarities. I think of Shane Claiborne’s Jesus For President, Tony Campolo’s is Jesus a Republican or Democrat? or Sojourner magazine’s “God is Not a Republican . . .or a Democrat” campaign. But these represent attempts from progressive evangelicals to bring balance to the force. Sauls is a conservative voice with strong convictions who has listened well to those across the aisle from him. This book promotes a generous conversational tone with Christians who are different from us and those outside the faith. I give this four stars. Notice of material connection: I received this book from the Tyndale Blog Network in exchange for my honest review. Neil Cole has written a book designed to get followers of Jesus to engage in mission with the five-fold gifts described in Ephesians 4:11-12, “So Christ himself gave the apostles, the prophets, the evangelists, the pastors and teachers, to equip his people for works of service, so that the body of Christ may be built up”. The so-called APEST gifts (Apostle, Prophet, Evangelist, Shepherd, and Teacher) provide a template for Churches and ministers hoping to impact the wider culture with the reality of the Kingdom of God. This book is designed to help church leaders and members of the body of Christ understand their contribution by recovering the gift and ministry that Christ intends for us. I believe the APEST acronym (originally APEPT) originates with Alan Hirsch who’s The Forgotten Ways (Brazos Press, 2007) covers similar ground. What sets Primal Fire apart from Hirsch’s is the level of detail he goes into looking at each of the gifts, and his rooting of each of the roles in the ministry of Jesus (the archetypal Apostle, Prophet, Evangelist, Shepherd and Teacher). In Cole’s first section of the book he points to Jesus as our chief exemplar, discusses the role of elders and deacons, and argues for the recovery of each of these gifts for our contemporary contexts. In section two, he profiles each of these gifts from Ephesians 4:11 and how they work together. He identifies the ‘start and go team’ (Apostles and Prophets) an the Stay and Grow team (Evangelists, Shepherds and Teachers). Section Three focuses on how these gifts, used together will enrich the church and re-invigorate it for mission. He also points to the danger of counterfeit gifts (super apostles, false prophets, Judaizers, hirelings, and false teachers). As I said, Cole covers a similar ground as Hirsch (who writes a glowing endorsement). While Cole does refer to passages across the New Testament, Ephesians 4:11 with its list of the five gifts is central to the organization of the book. Some readers will fault his appropriation of the term “Apostle” as one ‘sent out’ on mission to pioneer God’s work (rather than a historical, limited list of leaders commissioned by Jesus himself). Other readers may find his biblical case shallow as he does tend towards prooftexting. I think his profiles of each of the gifts are as rooted in his experience as a church planter as they are in his exegesis. Throughout this book he says what each of the gifted ‘tend to do’ (i.e. Apostles tend to…, Prophets tend to…). In many of these cases he is sharing personal observations of things he’s seen among the gifted. Verse 11 provides list, and verse 12 tells us that these gifts are given for the building up of the church. Verse 13 gives us the telos: these gifts are given to build up the church until they reach unity in the faith, knowledge of the Son of God, maturity and attain the whole measure of the fullness of Christ. Coles use of verse 13 is as proof for the continuing of each of the five gifts (63). He uses it show that the work is still incomplete, but his profile of each of gifts would be more grounded if he showed how these gifts serve this end (verse 11-13 are one sentence!). Thank you to Tyndale for providing me with a copy of this book in exchange for my honest review. 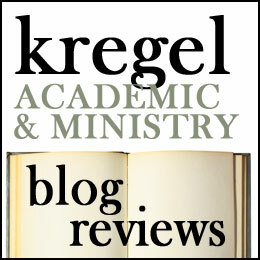 The problem with reviewing devotionals is that a timely review demands that you turn around a review before you’ve had time to live in the book. Such is the case for Anne Spangler’s Praying the Attributes of God. Spangler followed up her previous devotionals, Praying the Names of God and Praying the Names of Jesus by producing a devotional which focuses on the Divine attributes. She draws inspiration from A.W. Tozer’s books on the attributes of God, to produce a 17 week long devotional which focuses on the attributes and the character of God. What makes Spangler’s devotional good is that she doesn’t throw around ten-dollar-theology words. She talks about God’s immutability, omnipresence, omnipotence, transcendence, and immanence, but her chapter titles are much more user-friendly than that. 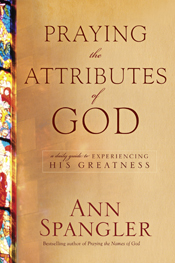 Her first chapter is a week of devotions focused on God’s love entitled ‘God Cares For You.’ Other chapter titles include: God is Better Than You Think (God’s goodness); God is Bigger than You Think (God’s infinitude); God is Not Moody (God’s immutability); God is Not Weak (God’s Omnipotence); God is Never Surprised; (God’s Omniscience); God is Never Frustrated (God’s Patience); God Always Knows What to Do (God’s Wisdom); God Has No Limits (His eternal, self sufficiency); God is a Lover (the Jealousy of God), God is Always Fair (God’s Justice); God Leans Towards Compassion ( God’s Mercy); God Never Gives Up (His Faithfulness); God is Better Than Anyone You Know (God’s Holiness); God is an Artist (God’s Creativity); God is Above All (His Transcendence). Each chapter has a week’s worth of devotions (Monday-Friday). Mondays have a key scripture passage and a brief Bible study which unpack that particular attribute. Tuesday-Thursday have brief devotions which help you pray through particularly scripture passages related to that attribute. Friday’s reflections relate God’s attributes to a particular passage. I have not lived in this devotion enough. I have only read through the first couple of weeks and skimmed other parts of the book. However I appreciate Spangler’s ability to root her reflections in scripture and get her readers to pray passages. Praying and reflecting on God’s love and goodness were good for me. I need to spend more time reflecting on this and This was helpful. Tozer’s books are meatier, but the way that Spangler gets us to pray ‘God’s attributes,’ takes us from passive readers to active participants in the life of God. This is a very good thing. I am unsure what I would think of later chapters. Briefly skimming through the book, I think that at places, Spangler’s account of God’s attributes seems overly simple. This is probably unavoidable in a devotional. This is, after all, not a theological tome. But the passages from the Bible are carefully chosen to illustrate particular attributes. Reading the Bible in this way means that you are not wrestling with apparent counter-testimonies. To say, for example, that God is never frustrated and is a patient God is true. Scripture reveals a God who is slow to anger and abounding with love and faithfulness (Exodus 34:6). 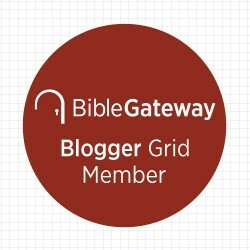 However, readers of the Pentateuch will also encounter passages where God’s anger burns against his obstinate people. In Exodus 32, God wants to destroy his people and start over but stops because of Moses’ intercession). This passage also challenges our understanding of immutability (God’s non-moodiness) because God apparently can change his mind. Passages like this challenge the categories we place on God. If we want to understand who God is and how he relates to his people, than we discover it in our engagement with the Biblical story. I agree with Spangler’s categories and like the scriptures she chose but I worry that dependence on devotionals like this rob people of encountering the God of the Bible who sometimes defies our expectations and acts in ways we do not fully understand. The narrative of scripture is the story of God’s relationship to his people. ‘The attributes of God’ is a framework borrowed from systematic theologies and imposed on the Bible to help us understand what sort of God we worship. This is helpful and I really like Spangler’s use of it. I just want readers of her book (and other devotionals) to go beyond the pages of her devotional and read the Bible with it (all of it!). That is a rather lengthy qualifier but I would recommend this book and I think it can be used fruitfully by those seeking to grow in their prayer life and in their relationship with God. Philippians 4:8 says, “Finally, brothers and sisters, whatever is true, whatever is noble, whatever is right, whatever is pure, whatever is lovely, whatever is admirable—if anything is excellent or praiseworthy—think about such things.” What is a more excellent and praise worthy thing for us to think about than God? I give this book 4 stars. Thank you to Tyndale books for providing me a copy of this book in exchange for my honest review.